Elopement wedding announcements are a great way of letting family, friend's, and loved ones know that you are newly married. These elegant Elopement Wedding Announcements are absolutely beautiful. With gorgeous typography and calligraphy style writing, backdrops of sparkles, romantic floral designs, and 'upload your own image' option, these Elopement announcements are a great choice. 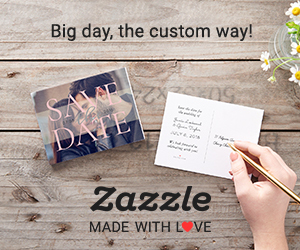 Filled with lots of wedding charm, these announcements can be personalized to your liking. Simply change, (if desired) the font, colour, style, and layout before choosing from a selection of paper types and finishes. Announce your post wedding nuptials in style with an Elegant Elopement Announcement.